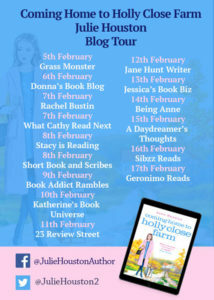 I’m so pleased to be taking part in the blog tour today for Coming Home to Holly Close Farm by Julie Houston and to be sharing a post about Julie’s inspiration behind the book. My thanks to Vicky Joss from Aria for the place on the tour. 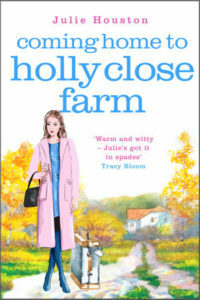 Coming Home to Holly Close Farm is the novel I’d been wanting to write for years but, because much of it is set in the past, I kept putting it off and going back to what I knew, ie the present. 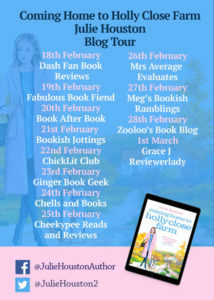 I’m so glad I finally got down to doing the research and writing Madge’s story, interspersed with that of Charlie in the present, because, of all my other books, this one really does have a special place in my heart. 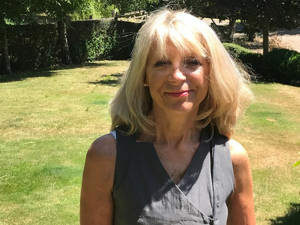 When my boyfriend at the time – now my husband – and I decided we were going to get married, there came the thorny issue of where we were going to live and what sort of house we should buy. We were both pretty independent people with our own houses and we’d both, in the previous year before we’d met, bought a house, virtually demolished and redeveloped it and were exceptionally proud of what we’d achieved. Neither of us wanted to sell up and move into the other’s house, especially as we were in different, albeit neighbouring, towns and, whichever one of us gave in and moved would not only have given up their lovely redesigned and refurbished house, but would have the inconvenience of a much longer journey to work. We seemed to be at a stalemate and there came a point when we almost ended the relationship because of the indecision as to where we should live. And then we saw the farm. It was up for sale, half way between both our respective homes and employment, and we both fell in love with it. Unfortunately, there was a problem. In front of the farm were acres of fields and beyond that a stone quarry. Now, we knew the owner of the quarry who told us, in no uncertain terms, we’d be mad to buy the house as over the next ten years or so the quarry would be used as a landfill site. There would be years of garbage lorries, rubbish, seagulls and rats. Determined to still go ahead with buying the house, I went down to the local library to find out more about the intended planning of the landfill site. ‘You do know the story of what happened at the farm?’ the librarian asked. ‘The murder,’ she said, with some relish. I spent the next few hours going through the newspaper articles and police reports of what actually happened one night in May during the early 1950s. I was absolutely fascinated and became almost obsessed to find out more of what happened and why, particularly as there are many, today, who believe the farmer, who was eventually hanged at Leeds county court, to be innocent of the murder. We didn’t buy the farm – the threat of rats and lorries rumbling past at all hours of the day and night, as well as the upsetting story of the murder put us off – but the farm and its former history have continued to fascinate me and I knew, one day, I just had to incorporate some aspects of its past into a story of my own. Coming Home to Holly Close Farm is the result. While the story of Madge and Charlie is totally fictional and has a resulting happy ever after, the seed of inspiration certainly began to grow from the farm we so very nearly bought and made our home. Thank you, Julie. What a fascinating place that farm must have been!